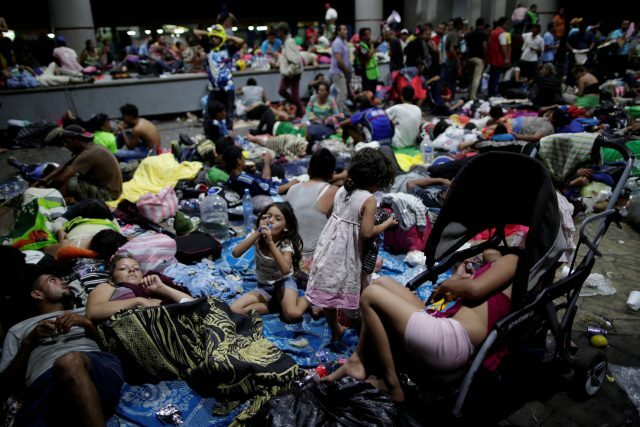 TAPACHULA, Mexico (Reuters) – A U.S.-bound caravan of thousands of mostly Honduran migrants whom President Donald Trump has declared unwelcome, crowded into the Mexican border city of Tapachula on Sunday, setting up impromptu camps in public spaces under a heavy rain. 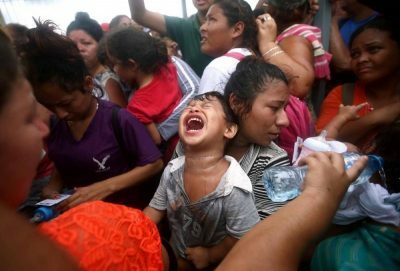 Child cries out as caravan rushes Mexican border. On Sunday, Trump said on Twitter that “full efforts are being made to stop the onslaught of illegal aliens,” arguing that the migrants must apply for asylum in Mexico before attempting to petition U.S. authorities. In southern Mexico, police in riot gear shadowed the caravan’s arrival along a southern highway, but did not impede their journey. “I just want to find some food and a place to sleep,” he said, explaining he joined the caravan last week with five family members and a group of friends from the violent city of San Pedro Sula. “I hope Trump allows us to make it to the other side,” he said. “We’re going to make it, we’re going to keep moving so long as they don’t stop us,” said Honduran Jaffe Borjas, 17, marching alongside a childhood friend at the head of the column that stretched far down the highway to the horizon. “If you send us back, we will return!” a large crowd shouted in unison. Mexican President-elect Andres Manuel Lopez Obrador, considered a leftist/populist. “I want to tell them they can count on us,” said Lopez Obrador, who will take office in December, to a smattering of applause. He reiterated that is seeking Trump’s support to help fund a development plan that could alleviate poverty in Central America and southern Mexico. 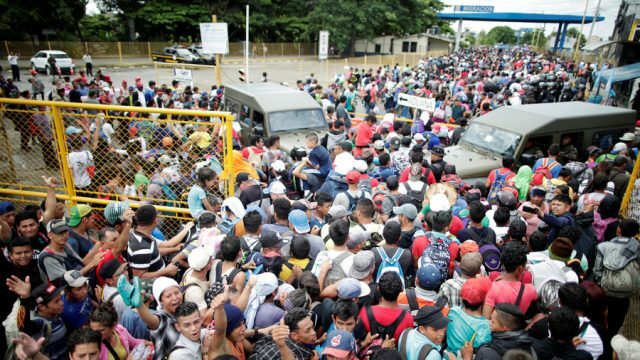 Migrant caravan storms border between Guatemala and Mexico. Mexico is now welcoming migrants, a reversal of its initial policy. Since the convoy formed last weekend, Trump has threatened to halt aid to Honduras and Guatemala, and potentially close the U.S. border with Mexico with the help of the military if the migrants’ march is not stopped. 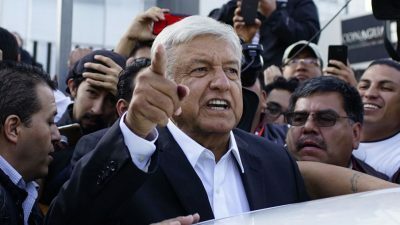 Mexico’s government has said throughout the past week that it would register the migrants and process requests for asylum. 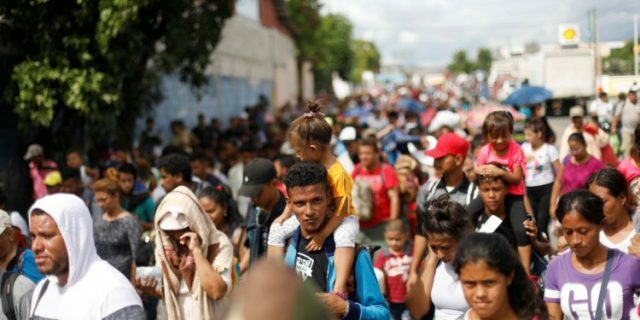 Those attempting to skip the process would face deportation, but the size of the caravan will test Mexico, which has sought help from the United Nations to manage the issue. Central American migrants challenge Donald Trump’s racist anti-immigration stance. “We’re urging people against migrating in an unlawful way and putting your children in extremely dangerous conditions,” Garcia de Hernandez said in a statement.